We’re in that in-betweeny time of year now. Cold starts and chilly evenings but with the potential for plenty of warmth during the day. Here’s how to deal with it. The most effective way to keep warm when cycling in colder weather is to layer up. Layers work much better than using one single big thick garment. The air trapped between each layer acts as an insulator so several thin layers should keep you warmer than one thick one. The air also helps dispel moisture so the layer closest to the skin will take sweat away from the body and pass it into the next layer, leaving you drier. Layers are also more versatile and adaptable. Having multiple layers makes it easier to regulate temperature so you can add or remove as necessary. To keep things simple, layers are broken down into three basic categories; base, middle (or insulating) and outer. AKA the cyclists’ secret weapon. Before we get talking about full layers, let’s talk about leg, knee and arm warmers. These are ‘bits’ of clothing that can be added and removed easily. They essentially turn short sleeve jerseys into long sleeve ones and shorts into tights or 3/4 length tights. They’re easily folded up and stowed away in your jersey pockets or backpack. They weigh next to nothing too. At the start of Autumn you often don’t need the full three layer get-up. A combination of two of the layers described below will usually see you right. If you want to err on the safe side then get yourself a gilet. This is basically a jacket without sleeves. Yes, it’s a body warmer in all but name. It keeps your core body temperature up whilst not causing you to overheat when you’re working hard. 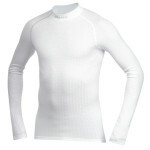 Base layers are the ones closest to the skin which are designed to wick sweat away from the body. Base layers keep you drier and feeling less clammy. Moisture is taken from the surface of the skin and expelled through the pores of the materials allowing the body to regulate temperature more effectively. Upper body base layers are available in long, short and sleeveless versions and some also feature compression or wind blocking properties. Compression garments make a few claims but the most relevant to cyclists are to do with reducing excessive muscle vibration during rides. This should help reduce general fatigue during a long ride and also make for a less achy day-after. A lot of riders here at Merlin Cycles use the base layers from Craft. They’re simple and simply great. It’s easy to forget, or not realise, but your hands and feet can also be shod in base layers. Hand base layers are usually called liner gloves. Liner gloves are the base in a glove layering system. 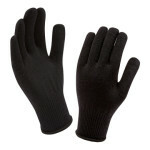 Use a pair of liner gloves along with a more weather resistant glove over the top for warmer hands. Using glove liners and a mid-weight outer glove is a great way of having warm hands instead of resorting to overly bulky, feel-reducing chunky gloves. Although you may not think of it, socks are actually base layers. A good pair is well worth the money and when combined with an over sock or overshoe will keep your feet toasty even in the coldest climes. The recent fashion for longer and longer socks is benefiting us UK riders too! If you keep your extremities warm it will really help prevent your whole body and core from getting cold. Your body can devote a lot of its energy and resources into trying to warm up hands and feet (the areas furthest away from the body core). Help your body to help itself. And the last but not least base layer – for your head. Even when wearing a helmet your head is really exposed to wind chill as well as rain. Modern vented helmets are great at keeping your cool during warmer months but these same vents can lead to frozen noggins if you’re not careful. The middle layer is all about insulation and heat retention. They are usually a mid-weight long sleeve top that can be worn on its own – as an outer layer – in milder conditions or under an outer shell when the weather is cold or wet. The move to windstopping softshell-type garments has seen traditional lycra long sleeve jerseys consigned to the rubbish heap of history. You can even get ‘transformer’ jerseys which have removable sleeves (as in the above pic). These are a bit more expensive than a pair of arm warmers but the tailoring and fit are usually spot on and stay in place securely. The outer layers are the final line in defence against the elements. They work at repelling wind and/or rain, depending on material, while allowing moisture to escape from the inside. They can be split into two basic categories: dry weather and wet weather. Dry weather outer layers are all about warmth and keeping wind at bay. And possible the odd passing shower. 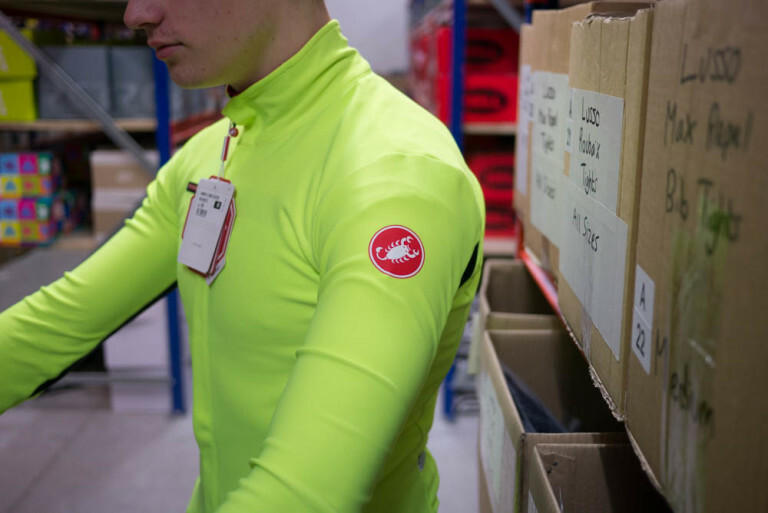 Castelli’s Gabba jackets have become something of a class-leading example of such a jacket. Windstopper fabric keeps the chill out but allows excessive body heat and moisture build-up to breathe out through the fabric. Wet weather outer layers are designed to keep rain out. Cheaper jackets are solely intended to do this, the fabric used doesn’t offer much if anything in the way of dealing with breathability or preventing overheating. This is dealt with by having zipped vents (for cooling things down) and with having mesh liners (a rudimentary way of dealing with body moisture). A high-end wet weather outer layer keeps the the rain out and regulates body moisture and heat on the inside too. It’s a tricky job and a task that is often biased towards one or other factors ie mountain bike jackets typically bias toward keeping the rain out at the expense of ultimate breathability, whereas road jackets are a bit more concerned with breathability and consistency. 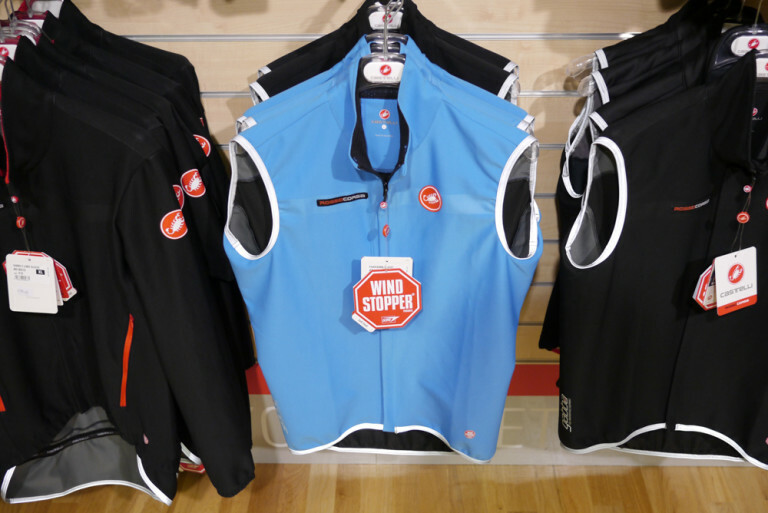 The stop-start nature of mountain biking also makes it trickier to achieve a consistently performing jacket. 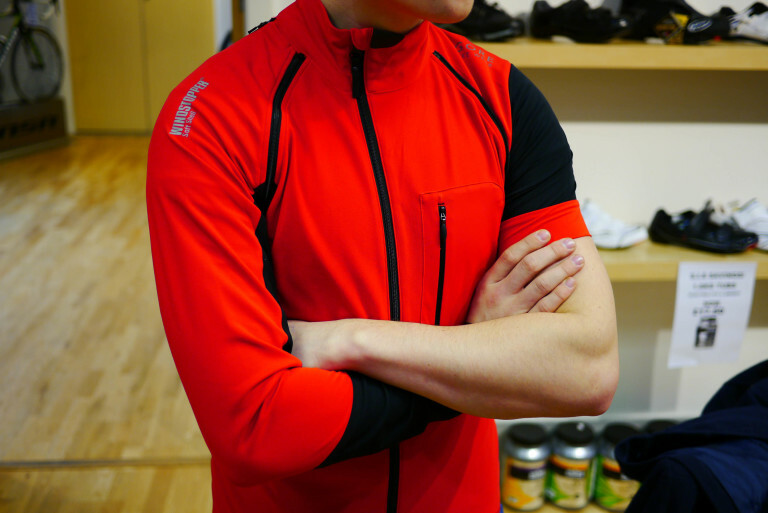 As such, MTB jackets are easily adjustable via venting, adjustable cuffs and collars etc. (this is an old post and the linked content no longer exists)Gloves and overshoes in other words. Overshoes are thankfully fairly straightforward. Get ones that are as warm as possible. 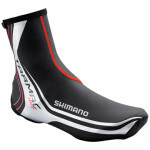 Entry level and mid-level overshoes are made of neoprene. The thicker the neoprene, the warmer it will be. If you don’t want the ‘elephant foot’ look of chunky overshoes then there are some slightly thinner polyurethane coated overshoes available. 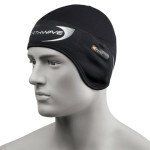 These are a bit thinner and are also a bit more waterproof. Mountain bikers are better going for waterproof socks rather than overshoes. Overshoes get instantly destroyed when riding and hiking around off-road. Brands such as DexShell and Sealskinz are what you want to be looking at. Gloves. Now then, gloves are a bit more complicated and a bit more based on personal preference. Why not just go for the chunkiest you can get? They’ll be warm definitely. Some riders however really don’t like how they can impair their bar grip, braking/shifting feel and – by extension – their bike handling. If you’re a performance-orientated rider then it’s worth looking at high-end gloves that use fancy materials – such as Windstopper – which keep the cold and wet at bay without ending up being too bulky. If you’re riding is more sedate or functional then you’ll not find any real issue with using less expensive chunky gloves. Tagged altura, base layer, beginner, castelli, Clothing, craft, gabba, how to, insulating, know how, layering, layers, mid layer, Shimano, sportful, technique, Winter. Bookmark the permalink. Very nicely written though these layers would cause problem in running or even walking but keeping yourself warm is the only requirement in winters. You can also have one jacket with added layers of wool neoprene and other warm fabrics available in market. Excellent post. We can not slow down our daily activities just because of winters so keeping our body warm with layers of gloves jacket shoes and socks is the only option.